DENVER — To understand the most detailed crowd analysis of the Denver Broncos’ entertainment, parade and rally in downtown Denver on Feb. 9, it helps to start with the simple analysis initially made by the Post-Telegraph. A number of 4.5 square feet per person was divided into the square footage available to the Denver Civic Center crowd (calculated at 1.2 million square feet through Google Maps). That’s because 4.5 square feet per person reflects a “dense crowd,” according to a 2011 article about crowd counting by Rob Goodier in Popular Mechanics. The length of the parade on both sides of the street was multiplied by 12 people deep to produce an estimate of about 362,000 for the parade route and Civic Center together. After contacting several experts to get their input, the Post-Telegraph learned that 9News reporter Nick McGill had produced a Feb. 10 attendance estimate of 700,000 people for the parade route and Civic Center. Like the Post-Telegraph, McGill also came up with 1.2 million square feet for Civic Center. In addition, he produced a square footage number for the parade route. A main difference from the Post-Telegraph’s calculations was his division of the total square footage by 2.5 square feet per person. McGill’s calculations were sent to journalism professor Stephen Doig at Arizona State University, and Doig said the 9News density was two times too high. He used 5 square feet per person and produced what he later called a “back-of-the-envelope” estimate: 350,000. 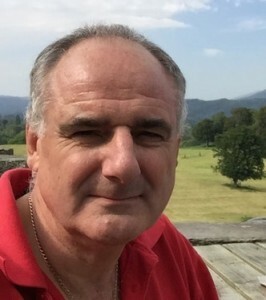 Manchester Metropolitan University professor G. Keith Still got one of his students, Alexandar Kollaritsch involved, and Kollaritsch estimated 198,000 attendees. The Kollaritsch calculations, confirmed by Still, have two big differences from those of the Post-Telegraph. 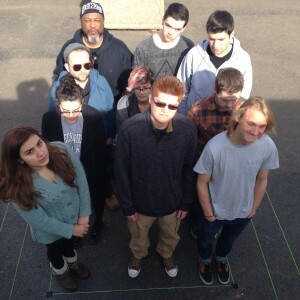 One is producing a more accurate square footage based on the area the crowd occupied rather than the capacity available to it. Using software developed by Still and an aerial photo, Kollaritsch showed with yellow lines where the crowd stood and calculated the square footage within the lines. He then added a number for people moving around outside the yellow lines. In the case of the Civic Center crowd, the square footage totaled 319,000, far less than the 1.2 million calculated by the Post-Telegraph. Aerial photos show large areas in Civic Center, such as snowy areas, that are very thinly populated during the rally and seem to confirm this approach. In his final analysis, Kollaritsch assigned two different densities to different areas of the crowd. Then he added 25,000 people moving around and 1,000 in front of the stage. Those last two numbers, the 25,000 and 1,000, were “based on experience of events and parades in Europe,” said Still in an email. Kollaritsch added that the people “moving around” are those outside of the yellow lines. Those inside of the lines are more densely packed and not moving much. Inside the yellow lines, he lists a density of 0.3716 people per square feet (2.7 square feet per person) in one area totaling 212,374 square feet. And he assigns a density of .185 people per square feet (5.4 square feet per person) to another area totaling 106,187 square feet. As for the parade route, Kollaritsch took the total square footage for the sidewalks and streets and added a little more standing space at crossings. Then he subtracted the cordoned off area of the street where people couldn’t stand and came up with a net square footage figure. Then he estimated a density of .232 people per square foot (4.3 square feet per person) for the first part of the parade route and .139 people per square foot (7.2 square feet per person) for the second part of the parade route. How did Still and Kollaritsch arrive at such densities? There are typically five to six people per square meter in front of a stage, and parades typically have densities of two to three people per square meter, Still said in an email, noting that he uses meters rather than feet. The second major difference in the Kollaritsch calculations was estimating that 40 percent of attendees went only to the parade, 60 percent went to both the parade and show, and 20,000 went only to the show. So, while he estimated that 178,078 people went to the parade, and 124,651 people were in Civic Center, the total of those two numbers, 302,729, doesn’t measure total attendance because then the analysis would be counting many people twice. Where do the percentages come from? “These are estimates based on typical European event distribution. There are assumptions which (given the timeframe) were made to provide an estimation,” said Still in an email. 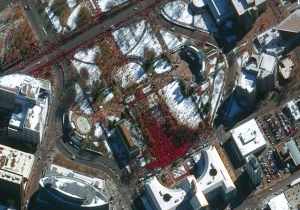 Kollaritsch noted that the 20,000 “show only” people were estimated in part from the crowd pictured in a satellite photo of Civic Center that was taken at 11:11 a.m. that day — after the entertainment had started but before the parade began. He added an estimated number to the number in the photo. Tom Locke, is a Denver-area journalist and affiliate professor at MSU-Denver.